It may have taken what felt like a day to dig and prepare our first trench bed (45cm depth x 3m length x 0.5m width) but what it did was get me in touch: I now know the intimate details of the soil’s make-up and where the sunny spots are in the courtyard at various times of the day. Best of all, there’s no doubt that our vegetables and herbs are going to have a nutritious and balanced diet. I attended the Soil for Life course recently, so it’s thanks to Pat Featherstone (our inspired teacher who also wrote the manual) and Livingstone (who got us involved in the practical side) that I can confidently share the following information. 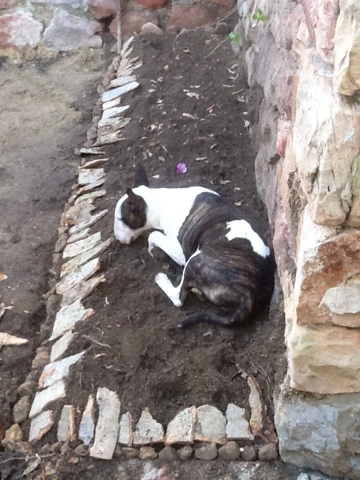 What is a trench bed? You could think of a trench bed as a compost bin that’s dug into the ground. The bed is made up of alternate layers of fresh green organic material, dead organic material, manure and soil. This organic base is pretty much a dream diet in the making for your future plantings of vegetables or other plants. Trench beds are a good way to go if you’re living in a dry area or if you have poor or average soil. The bed allows for excellent aeration, water retention and a long-term supply of nutrients for your plants. It requires some muscle power to begin with… but you won’t look back once you’ve started! 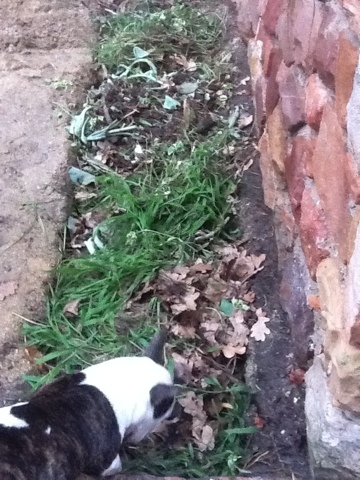 A spade, fork, water, newspaper, sticks, dead and alive organic matter, manure and mulch. You will also need compost if you want to plant sooner rather than later. 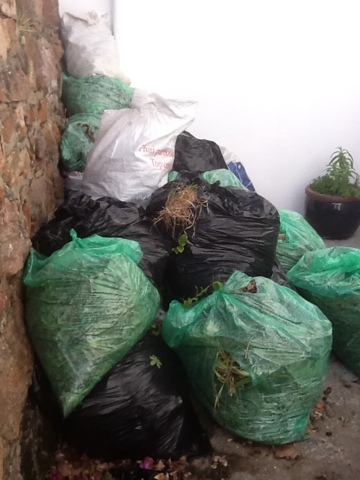 Divide your organic waste into ‘live waste’ (green garden and kitchen waste, moist seaweed, horse or cow manure, any fresh untreated organic matter) and ‘dead waste’ (any of the former, but dried out). Meaure out your trench. It can be as long as you like but shouldn’t be wider than a metre (to allow for easy reach). 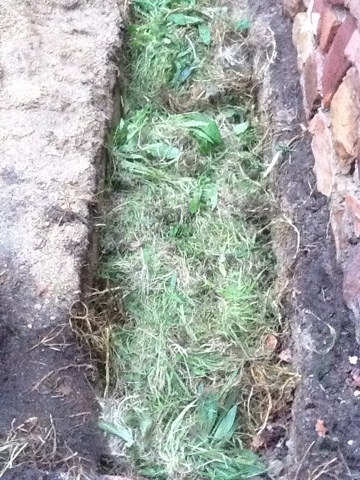 Dig out the first 30cm of top soil (pile the soil next to your trench and remove any stones). 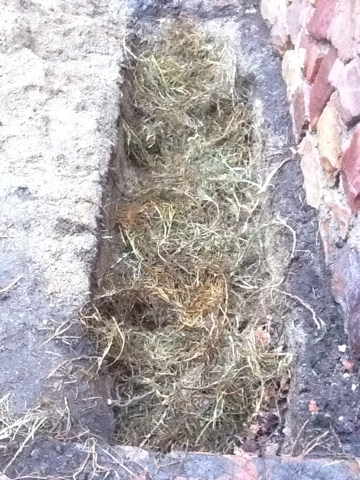 Dig out the the next 30cm of sub-soil (place it in a seperate pile and remove any stones). Use a garden fork to loosen up the base of the trench. Cover the bottom and sides of the trench with NEWSPAPER (or cardboard). Moisten the paper with a sprinkling of water. 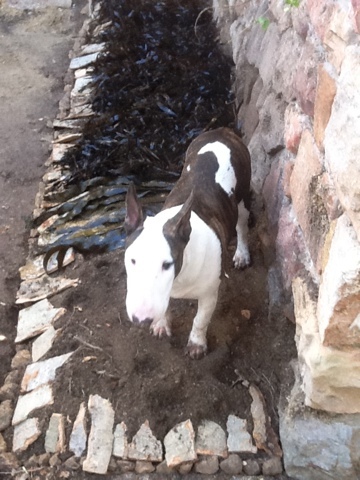 (I skipped this step because the base of this trench is like solid rock and it is the rainy season so no need to use paper to retain extra water). 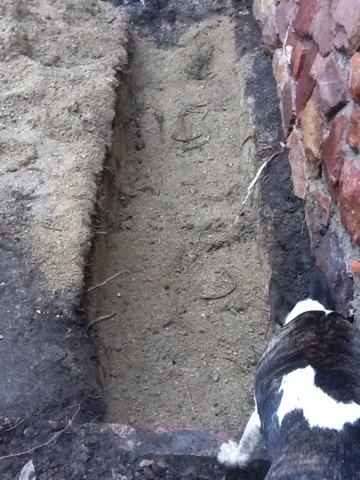 Lay STICKS (or other course material) over the base of the trench — aim for a height of 20cm. Lay 10cm of SUBSOIL over the sticks and water. 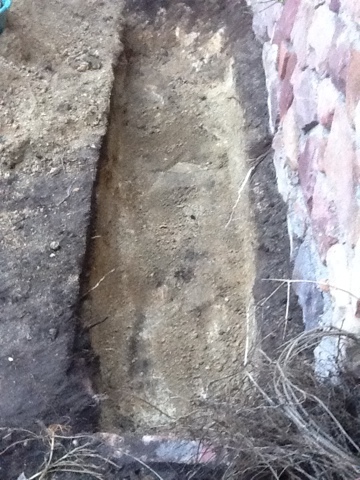 Lay 10cm of DRY BROWN material over the subsoil and water well. Lay 10cm of WET GREEN material over the dead, dry brown material and water. 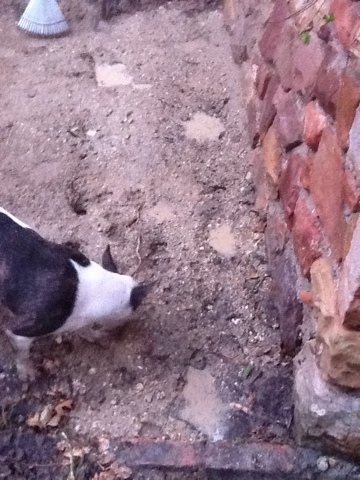 Sprinkle horse or cow MANURE over the top and water. 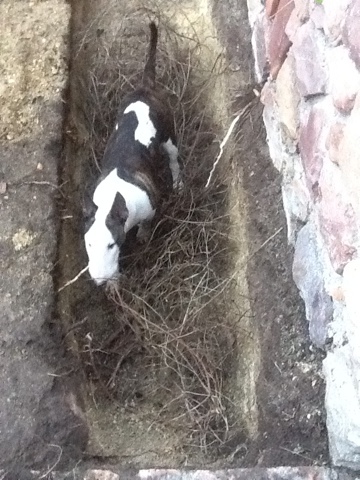 Repeat this layering process (leaving out the sticks and newspaper at this point)… until the trench is full. Insert 1/2 metre long marker sticks into each corner of the bed. Lay the TOPSOIL over the last layer. 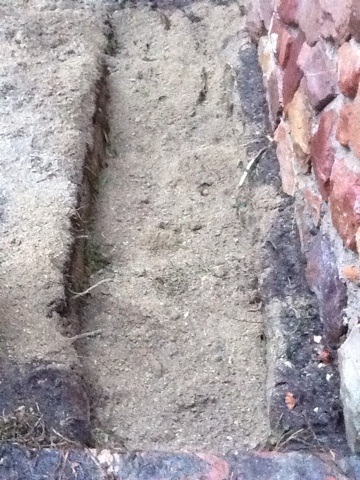 The surface will be about 20cm higher than the surrounding ground at this stage. It will drop over time. Let the bed rest for a month before planting. Alternatively you can speed up the process by working COMPOST into the topsoil before mulching. Use a bucket of compost per square metre, level the area out, water well and begin planting. PS. Avoid walking on the bed! Also, even though you have given your plants a great start, keep feeding them with a weekly liquid natural home-made fertiliser… and keep composting every now and again.